Nelson Mandela's former wife Winnie said it was "very painful" seeing his body lying in state as "in our African tradition we don’t display the departed". She told ITV News: "It’s very hard for the family to even share him even in his death after sharing with the whole world and our whole country while he was alive. Winnie Mandela told ITV News it was 'very hard' to see Nelson Mandela's body lying in state. "He’s still not really just ours, the family, he still belongs to the whole world and we have to share. Winnie Mandela has said the moment the military came to take the body of her former husband away was the "heaviest moment of all" as she realised he was leaving the house for good. Speaking exclusively to ITV News presenter Mark Austin, she said: "I don’t know how others felt but when that final hour came, the military in uniform and acting so officially. It only struck me then he was leaving the house for good. "I must say, I must have a strong heart because that was very difficult to take. I couldn't contain myself. In an exclusive interview with ITV News, Nelson Mandela's former wife Winnie said above all she will remember him for his legacy of peace and reconciliation. Winnie Mandela told ITV News presenter Mark Austin: "At no point did he ever think of himself". "His whole life belonged to the nation and to the world - and that is how we will remember him, that never at any stage thought of himself. He gave up everything for the nation". Nelson Mandela's former wife Winnie told ITV News in an exclusive interview she was "blessed to be there for his last breath". 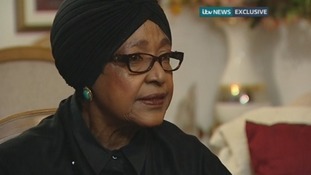 Winnie Mandela told ITV News presenter Mark Austin: "I went close to him and I noticed he was breathing very slowly ... I was trying to feel the temperature [of his skin] and he felt cold. Then he drew his last breath and just rested". In an exclusive interview with ITV News, Nelson Mandela's ex-wife Winnie said she felt he had "completed his journey". Winnie Mandela told ITV News presenter Mark Austin, "Even though he was 95 and had done so much, still there was so much that was still not done." "But I felt in his case he had completed his journey and it was inevitable - it had to come sometime," she added. Winnie Mandela told ITV News presenter Mark Austin: "I went close to him and I noticed he was breathing very slowly ... I was trying to feel the temperature [of his skin] and he felt cold. "Then he drew his last breath and just rested ... He was gone".